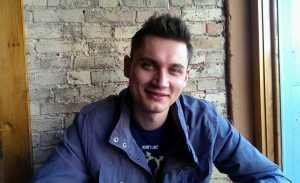 For a good few years now, Dmitri Belichenko has been a regular contributor of new music released by our label, Shockwave-Sound / Lynne Publishing. His music tends to be electronic, but with orchestral elements and use of sound design as part of the compositions and production. Often raw and unforgiving, his productions – some of which have an edge which lends itself perfectly to futuristic productions, science fiction, post-apocalyptic worlds, and others with a sense of awe, amazement and beauty, weaving images of wondrous nature scenes, amazing footage of natural beauty. Dmitri is also a terrific producer of dance music. Dance floor thumpers with an urban edge and a deep, relentless groove. We sat down in conversation with Dmitri to talk about music and life. Dmitri Belichenko — I believe I’ve also seen it spelt as Dmytro Belichenko? — sounds to me like a name with a Russian background. Can you tell me a little bit about your background and your history? Have you always lived in Canada? Actually, Dmytro is a Ukrainian spelling of my name. It can be spelt both ways, but in Canada, I prefer Dmitri, seems easier to pronounce. I was born in Lviv, Ukraine, a beautiful city with a rich history. My childhood was pretty average for a Ukrainian kid in a middle-class family. I had no idea that my life would change drastically when I turned 15 and my parents decided to immigrate to Canada. We left everything behind and came to Canada with two suitcases and no real prospects. When I started high school I was fortunate enough to find a part-time job as a dishwasher and that helped us pay rent and get by until my parents found jobs. Both my parents were engineers but it was really tough for them to find a job in that field. My mom ended up sewing for an alterations shop and my dad started painting houses and apartments. Eventually, my mom joined him and they started their own business. I worked with them from time to time but by then I already started DJ’ing in local clubs and was seriously considering music as my career of choice. I guess you were just too young when you left Ukraine, to really have a good sense of the music scene there, but do you remember what music you were listening to back then, and do you think a seed of interest in music production was planted already in your childhood back in Ukraine? Yes indeed, I started getting into music back in Ukraine, but not so much in childhood. Like most, I was more interested in Nintendo and hanging out with friends. The geeky, glued to the computer, addicted to music making behavior didn’t start until about 13 years old. In school, we shared music between friends and so I came across a few electronic artists like Cosmic Gate and Brooklyn Bounce. These really caught my ear, and from there I went on to seek out more artist and just became interested in electronic music in general. Growing up in Europe, trance and dance music was around all the time. You’d often catch ATB on the radio and so this was not unusual for kids my age to get into electronic music; not all wanted to start making their own however, haha. When I first started dabbling in music production these artists were my early inspiration. At what time did music become important to you, and have you always known that you were going to be a music composer, or have you done any other work that’s been important to you? When I lived in Ukraine I was planning on becoming a doctor or something relating to a medical field. I started attending an after-school program at the university that focused on biology and genetic research. I really enjoyed interning at the university genetic lab where I studied different microorganism cultures for antibiotic synthesis. 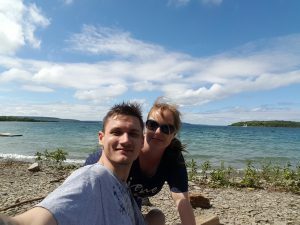 I did get a chance to finish the program that could have helped me get into university, but by then we were already planning our move to Canada. To prepare for our immigration interview my parents bought our first computer. My dad wanted to learn some CAD software relating to his engineering, but for me, it was my first introduction to computer music. It was a very slow computer, a Pentium 1 with a whopping 133 MHz processor and 16 MB of ram and Windows 95. I remember this because it was quite a challenge to run anything on it. When I was around 14 years old I came across this very basic music making software called Dance eJay, it had a playlist type setup where you placed some pre-made loops that all fit together into a composition. It was pretty limited but I could chop the loops in all kinds of ways and still come up with some pretty cool (so I thought) sounding tunes. That’s when I really became interested in electronic music. Not long after that we were selling everything and preparing for our move to Canada so the old computer had to go too. Once we moved I was still considering a career in a medical field, but music started to take over my life. 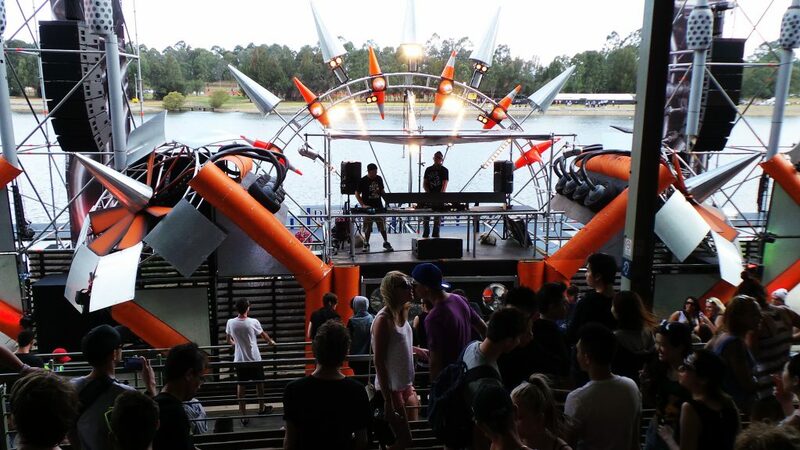 I attended my first underground rave at 16, and I fell in love with electronic music. Seeing DJ’s up in the booth commanding the crowd really made me want to do that too. I immediately started saving for my own set of turntables. Digital was not around then so I would spend any spare time digging through crates at the local record shop picking up my first records that I would eventually play at my first gig. 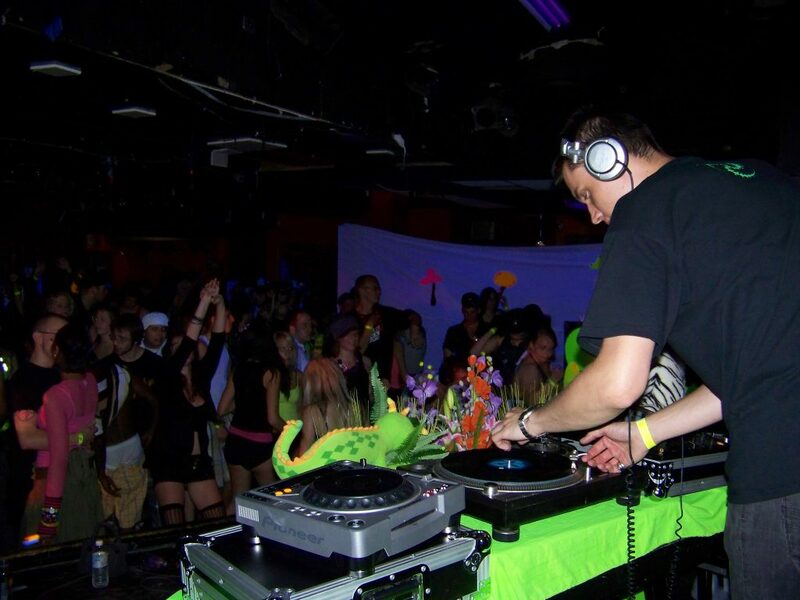 I was still in high school when I started DJ’ing at raves and so it really shaped my taste in music. When I finished high school I decided to stay true to my passion and chose to go to an audio recording technology college. Do you experiment a lot with different music styles and genres, or do you tend to stick to a particular genre? Originally I would only produce electronic music. I enjoyed listening to all kinds of music, but I felt like I wasn’t musically savvy enough at the time to explore composing other styles. Growing up, my dad introduced me to rock music, AC/DC, Metallica, Led Zeppelin and so on. Hip-hop was on the rise during my high school years so I listened to quite a bit of that also. Oddly enough, I also enjoyed classical and orchestral music. I loved movie soundtracks too. The first Matrix movie had just come out and I remember the soundtrack by Rob Dougan called “clubbed to death” was absolutely amazing as it combined orchestral and electronic elements which were pretty forward-thinking at the time. I think that’s why I like to experiment with combining different genres in my music also. Nowadays I tend to experiment even more since I’m getting comfortable writing more complex movements and understanding how to speak through music. As a music composer myself, I find sometimes that I’m listening to a piece of music that really inspires me and I start out thinking “I’d like to try to make something like that”, but when I actually start to produce my own piece, it actually ends up taking its own direction and developing into something quite different from what I had in mind when I started. How does this compare to your creative process? I do also get inspired by the music I listen to. Often times you do have to simply let the music write itself. Sometimes I have different versions of the same idea, branches of sorts, saved and then I keep shaping whatever one I feel like the track calls for most. I write a lot of electronic music, so I have a lot of concepts of small grooves or melodies that I come back to and develop further. I get inspired by the sounds of my synths. I love to just play around with different waveforms and effects until I make something worth saving. Every once in a while, when the inspiration strikes, I just sit down and make a track from start to finish. Sometimes I have nothing to show at the end of the day but I still feel like I learned something, or tried something new, so it’s never a day wasted. I’ve seen your name connected with the artist name “Klone Z” or “KloneZ” – can you tell me about this, and what is this artist? Is it just another name for Dmitri Belichenko? Well, “KloneZ” was my DJ name at first, before I started releasing any of my own music. I kept this name as my alias for my electronic music. It was actually a name that my friend and I came up with back in Ukraine, it was what we called ourselves when we collaborated on our first attempts at music production. We were both the same height (6’7”) which is pretty tall, so we’d always stick out in a crowd. People would say that we’re like clones and so that turned into “KloneZ”. Before I started releasing any tunes I asked my buddy if he didn’t mind me using this name as my alias. I wouldn’t say it’s just another name for Dmitri Belichenko, as KloneZ has been used mostly for my electronic music and is also my DJ name. Do you always work alone and produce your music by yourself? Or do you sometimes collaborate with other musicians and try to create something together? I like to collaborate with different artists, I think it brings out a great variety to anyone’s sound. It’s easy to get stale and fall back on the production techniques you know and feel most comfortable with. I feel like collaborating with different artists helps me find more angles to attack the music production from, and learn new skills. I’ve never actually sat down with someone to produce a track together however, I collaborate online with artists from all over the world. So for me, it’s still a solitary experience but the creative aspect of it does feel collaborative as we bounce different ideas back and forth to create our tune. We already know that you compose and produce music for stock music libraries such as Shockwave-Sound.com, but have you also made bespoke music especially for a film, game or other media, where you actually composed music specifically for the project? Writing for Shockwave-Sound has opened many doors for me. 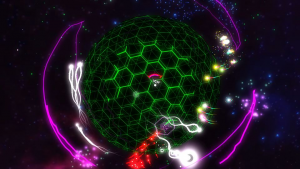 I wrote music for several short films and a TV show called EdgeFactor, I also did a few indie video games. I’m actually working on one now where the music is a big part of the game. The game is called BeatPlanetMadness (BPM) and is in beta testing (not sure if this will be the official name once it’s released). It’s being designed by an indie game studio “Dog eat Dog games” and is a pretty clever twist on an arcade shooter where you have to time your shots with music in order to pull off special abilities. The better you do in the game the more layers of music are added to the soundtrack. All the enemies and abilities are also adding to the soundtrack as little bits of melodies so it actually ends up being quite a fulsome sound as you progress through the game. All of the game’s sound effects and music is created by me, so I’m pretty excited about this project. Other than that I always have media projects and tv commercials to work on, which keep my days pretty interesting. So, having your music represented at Shockwave-Sound.com has actually led to clients contacting you personally with requests for writing custom-made soundtracks for them? Has this happened on other occasions as well, in addition to this VIVO game? Shockwave-Sound.com is a great platform for releasing my music. Since I started with Shockwave-Sound I had my music used in a number of video game trailers, movie trailers as well as in-game music, and soundtracks in tv shows and films. Sometimes videographers, after finding my music on Shockwave-Sound.com, will contact me for custom soundtracks in their multimedia projects. From there it helped me build my portfolio of custom work. I feel like releasing my music at Shockwave-Sound helps it find its way in all sorts of projects. Can you tell us something about your recording setup, e.g. main pieces of hardware and software that you use for your composing and recording sessions? I run a Windows-based workstation, with a Lexicon audio interface. Most of my music is created in the box, but recently I started adding a few hardware synths to broaden my sound a bit. I love using the Arturia’s MicroBrute analogue synth for my bass, it’s been my go-to staple. There’s no way to save presets on it, so you get to be quite creative with it every time you start manipulating waveforms. I recently got a Microkorg XL, I like the way it sounds, and I really dig the software editor that comes with it, so it’s been a great synth for leads and pads. These are not expensive top shelf synths, but since I did everything in software before I decided to start small and see how it would shape my sound. I mostly write in FL Studio, I’ve been using this software since I was about 15 years old so I’m very comfortable in it. I use a lot of EastWest sample libraries, especially love their pianos. My latest addition is the Xfer Serum soft synth, I absolutely love this thing. It’s a wavetable synth so I’ve been creating my own wavetables using MicroBrute and it’s really sounding quite phat. What are your favourite artists for when you just want to listen to good music? I’ve been into Hard Dance and Hardstyle since my early electronic music days. I used to listen to a lot of artists in that genre, Scott Project, ASYS, Headhunterz, and I still do listen to their stuff. I also love Deadmau5 productions, his sound is really quite clean and tight, I just saw him live in concert with his cube 2.1 visuals which was pretty sweet. Noisia also has incredible sound design and production quality, so I listen to them quite a bit. I also enjoy softer electronic music like Kaskade and Bonobo. I started digging into a bit of techno, so anything out on Drumcode which is a Swedish techno label is likely to end up on my playlist. Besides electronic music, I also enjoy alternative like Ben Howard, or hip-hop like the Living Legends. I listen to trailer music too, Two Steps from Hell, Really Slow Motion, have some pretty epic tracks so these are often good for my morning workouts. So you use the mornings to work out? What sort of stuff do you do for exercise, and do you feel exercising and staying in shape physically helps you in your creative process as well, for writing music? I think it’s a great way to start my day. It does clear my head and I feel energized and ready to work. I usually go through my 20-30 minute morning routine and have a few minutes of silence before I get in the studio. I think it does help me get into a good mindset. Sitting at the computer desk all day does have its dangers, so some activity in the morning helps me feel better mentally and physically. For the past few years, among the many different artists from all over the world who regularly supply music for publishing via Shockwave-Sound, Abbas Premjee has been one of the more prolific and active ones. 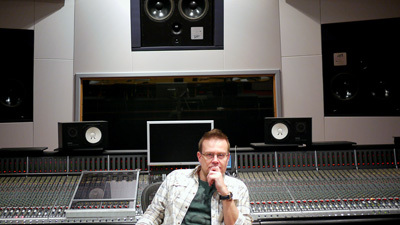 He has composed many great tracks of stock music for Shockwave-Sound. I was intrigued by the varied musical output and some of the interesting sounds and moods that Abbas creates with his many different instruments, so I took the opportunity to catch up with Abbas and have a nice conversation with him about music and life in general. 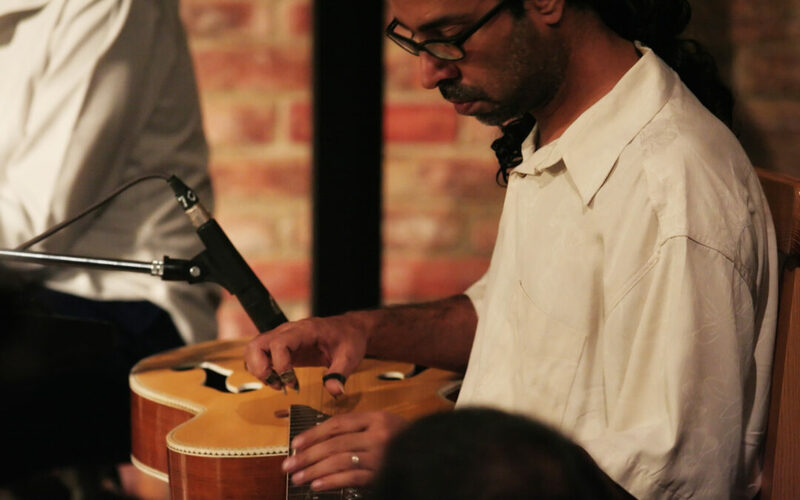 Leaving the actual music aside for the moment, who is Abbas Premjee and what’s your story? Have you always lived in Irvine, California? First of all, thank you for this opportunity to tell you my story. I was born in Karachi, Pakistan. My Father was an entrepreneur and had several businesses which were quite successful. He was a self-made man and it was assumed that my brother and I would take over his responsibilities for which we were being carefully groomed. Fate, however, had different plans for me. Ever since I can remember, music and sound have fascinated me and any kind of musical sound would have a great emotional effect on me. Growing up in Pakistan was not the same as growing up anywhere else. This was the time in the early 80’s, martial law had been enforced and Islamization was on the rise. Needless to say, finding musical instruments, supplies or instruction was close to impossible. For me, however, this just made it more exciting. Just to remind our younger readers, at that time in the world, there was no internet and information was prized and hard to come across. For this reason, I was mostly self-taught and learned by ear and through some books. However, I now believe that this has worked to my advantage. I spent many hours trying to decipher the chords and solos from my early influences which were filled with whatever Western music I could get my hands upon. Thankfully, there were some wonderful artists I was also exposed to through my cousin, who had studied in the US. Amongst these was Pink Floyd, The Eagles, Steely Dan and others that I still listen to today. 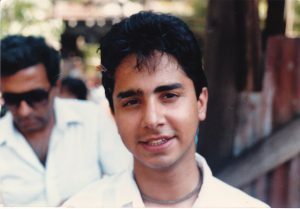 At the age of 16, my parents sent me to the US to get a university education. I was enrolled in the Mechanical Engineering program at Loyola Marymount University. I decided to take a class in Jazz improvisation, I had no idea at that time what it meant. Through that class, I met other musicians and eventually understood the rudiments of jazz improvisation. 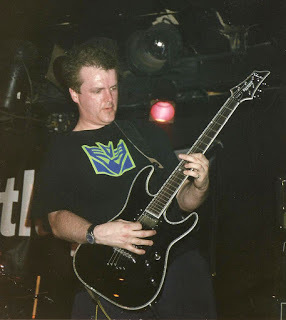 I was also approached by other musicians to join their band as a guitarist. We did a lot of rock and roll and would occasionally travel up and down the California coast playing gigs. That was a really fun time for me. It was during my senior year in university that my life took a turn. I had decided to take an elective class in something which I did not understand at that time but sounded interesting. It was called “classical guitar”. I give credit to my teacher at that time. He was an inspirational figure for me and that first class with him is still fresh in my memory. He made me realize that I was just beginning a long and beautiful journey. I had no choice but to spend another year in University and declare a double major. A year later I graduated with a degree in Mechanical engineering and a degree in Music theory and composition. My journey had just started and I had to continue. On the suggestion of one of my teachers, I applied for a Masters program at the University of Cincinnati Conservatory and was accepted. I was offered a scholarship and I was over the moon. I was flung headlong into an environment of the most amazing musicians I had ever seen. An environment full of history and academics all focused purely on music. I was very new to the classical music world compared to my peers, most of whom had been in this for many years. This was a glorious time of my life and was filled with many beautiful experiences such as playing in Masterclass for some of the top classical guitarists in the world such as Manuel Barrueco, Pepe Romero and others. 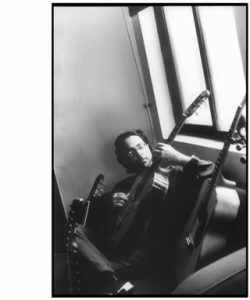 I finally graduated from that reality in 1993 with a Masters degree in Classical guitar from SMU in Dallas, TX. 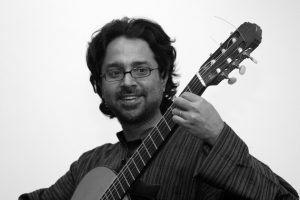 My goal was to be a professional classical guitarist but fate had other plans in store for me.Around that time, I received a phone call from my father who asked me to return to Pakistan as he was getting old and needed help. I could have never refused him and so I returned to Pakistan at that time, a lost soul. I had all this music and knowledge inside me but was instead thrust into the business world. For ten long years, I tried to the best of my ability to help him. Eventually, my father passed away and the business collapsed. During these ten years, I hardly did any music and I was like a fish out of water. I was dying to get back in. The year was 1996 and the world had changed a lot during those years. Digital audio was in its infancy and I knew I wanted to get back into music but being ten years older I was looking at things from a business standpoint as well. I was now married and starting a family. I did not want a gigging/touring life anymore. I was looking for stability and having an engineering background as well, decided to invest in a music composition and production studio and teach myself all I could. At this time, I was still living in Pakistan but I could see that this was not the place I wanted to bring up my family and so in 2009, I sold my studio and returned to the United States. A year later my family also joined me and we moved to Irvine. I was desperately trying to find my place and spent the first couple of years teaching and playing classical guitar gigs at weddings and events, just trying to survive. Around this time, I started writing, just for fun and discovered that there was a royalty-free market for music and put a few tracks up. I saw a few sales and even though the returns were minuscule, I saw the potential If I had a lot more music. At that time, we were living in Little Rock, Arkansas. I decided I had to be bold and we made the decision to move to Irvine, California. I spent the next six years there and exposed myself to all the opportunities available. I discovered the phenomenon of production music, which I did not know existed. I attended as many events, conventions etc as I could and soon developed a network of publishers, agents etc. All the while, I was writing feverishly and in almost any genre I could. The only way of getting good at anything is to do it and the more you do it, the better you get at it. I used this logic and soon enough developed a sizable catalogue in many genres, including several that I was not very good at. I understood the values and priorities of production music but at the same time tried to retain my personal identity. Looking back, I can see that I was fortunate in that along the way, in my musical life, I had played many different genres including rock, pop, jazz and classical. I had also extensively studied Indian classical music, the ragas etc which had a profound impact on my musical vocabulary. 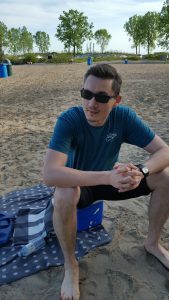 After living in California for six years, and establishing a path ahead, I felt I could now move to any place and be able to work remotely. Over the summer we moved to Houston TX, to be closer to family and that is where I am currently living with my lovely family which consists of my lovely and wife, without whose support I would never have been able to come this far, and three beautiful kids. That is a truly remarkable story and I guess it goes to show how people can end up in a place, and in a life, that they would never have imagined. I’m sure your story would make for a pretty good Autobiography sometime down the line. Did you ever think of writing about your story and your life’s journey? I never really thought of that, but am open to the idea, especially if reading my story helps or inspires others. You mentioned the situation in Pakistan in the early 80’s with Islamization and martial law coming in the way of your development as a musician – though, clearly, they did not succeed in keeping you down. Can you tell us a bit more about the plight of musicians and artists working under those circumstances and how they can overcome the obstacles in their way? Today the plight is not about access to information, like it was in those days, because today, with access to the internet, information is no longer a barrier. The real plight, as it also was back then, is poverty and class structures that don’t allow the poor to improve themselves. I was very fortunate that I came from a family where my parents could afford to send me to the United States for further studies. Today, in Pakistan, there is amazing talent and there are some accomplished musicians and bands but it is mostly Western or Bollywood influenced. The folk and classical music has suffered and, unfortunately, may be on the brink of extinction. During the time you’ve been actively composing music, how would you say this art form changed and developed, for you personally – and in general? Over the years of writing music, my writing has changed considerably. Before I was only trying to express as an artistic statement of some sort. I remember it always had to be profound. It was a lot more personal and I was a lot more possessive about my music and very closed to criticism. I changed a lot! I had to look at this very personal phenomenon through a business lens and that was very difficult initially, but the more I wrote, the easier it got. I developed an openness to criticism and started listening to a lot more different genres and started listening very critically to my own work and worked to overcome my weaknesses and I started to approach it more clinically. I am still doing that and I don’t think that process ever stops. You keep trying to improve the quality of your music and that is the fun of it. The beauty of this journey is the ever-changing terrain. As a publisher and distributor of production music, I like to keep my ears open and listen out for what kind of music actually gets used in today’s productions, be it on TV, online or in other media, and it occurs to me that a lot of the music that works best in media is, for lack of a better term, “simple music”, with maybe just one or two instruments playing at any given time. However, the music that we receive for publishing often tends to be much more layered, with a lot more instruments playing on top of each other, and perhaps “overproduced”. Do you have thoughts on this, and do you ever set out to produce music with only one or two instruments playing? You’re absolutely right. Today we have a tendency to say a lot more than required, too many instruments and cluttered sounds etc. It is a lot more difficult to say something of importance in a few words. It requires elegance and eloquence, these things come after many years of trial and error. It reminds me of what I learned in Graduate school, that beauty is in subtlety. In today’s quantized and perfect world, much beauty has been lost. The production music industry has mostly newcomers and a few seasoned composers that think that way. I think it would be a real challenge to deliberately make an album with just two instruments, any two instruments and make it work in a production music setting. That may very well be my next project, thanks for the idea. What are your favourite artists for when you just want to relax and listen to good music? Aah, that has been one of the few drawbacks of this lifestyle. I rarely get a chance to just listen like it used to be. Before I would curl up with a favourite album/CD and do it just for the fun. Now, when I do have spare time, which is rarely, I like to give my ears a rest and let them refresh. I listen to a lot of music but a lot of it is for work-related research or the kids at home blasting their own tunes. A quick search for Abbas Premjee on YouTube brings up a video in which you play an unusual instrument – the Mohan Veena – with a very beautiful sound. What is this instrument and how did you get into playing it? I first came across the Mohan Veena, at a friends place in Pakistan in 2005. I was musically at a point where I had recently gotten back into music after my 10-year hiatus and had started to write a little bit. I was in a mood to explore new sounds and ideas and this seemed like the perfect direction to take. 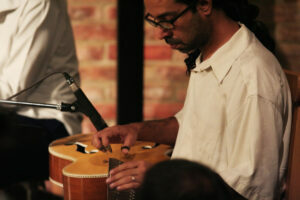 To tell you a bit about this instrument, It is also called “Indian slide guitar”. It is fitted with 20 strings and played lap style with a metal slide. 12 of the strings are sympathetic strings and add a beautiful resonance to the instrument. By sympathetic I mean they are not struck but tuned to the notes of the raga being played and they vibrate sympathetically. Being a slide instrument it is capable of playing microtonally which allows the true essence of Indian classical music to come through. 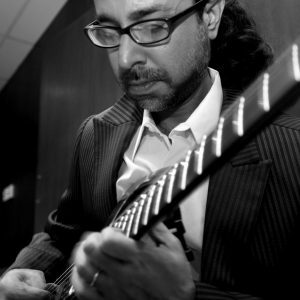 I bought the instrument on a trip to India and took instruction with Ustad Raees Khan, the renowned sitar maestro and gave me the opportunity to study the theory of Indian classical music. 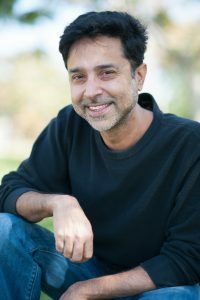 The theory of Indian classical music has been evolving for thousands of years and has a deep understanding of the connection between notes and human emotion. For a few years, that is all I did at that time. This music captured my spirit and gave me a totally new vision of the experience of music. I found here, a vocabulary of sounds and emotions that were totally alien to Western ears and I was very intrigued by the possibility of combining these sounds with jazz. This also led to my first commercial album release in Pakistan which was called “Elements” which you can listen to on my website and two more follow-up albums called “Crescent Moon” and “Symbiosis”. These three albums represent my efforts at finding a synthesis between Western jazz and Indian classical music. I hope to do more of this in the future sometime. Do you play, or have you played in the past, any other unusual and exotic instruments? As part of my efforts to constantly improve, I am always on the look for new and unusual instruments. I try to make an effort to use real instruments whenever possible, even if that means just a shaker! Real instruments add soul to the music. None of my other instruments can be considered exotic. 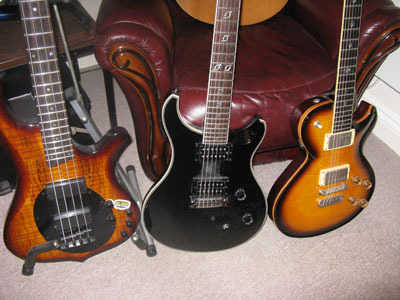 I have many guitars, basses, ukuleles, mandolins and lots of percussion instruments which I have started to collect. I love instruments. You seem to have a wide repertoire of styles and genres that you work in – is this a deliberate choice, and do you feel there are some styles of music in which you do your best work? Growing up, I played and listened to many genres of music. However, after studying classical guitar and getting into classical music, a sort of musical snobbery came over me, as is often found with classical musicians. I had to make an effort to get over that and play other styles of music, this was essential and very liberating. 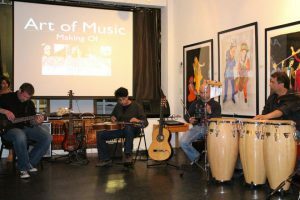 Music has so many forms and in my opinion, the best things happen when you do not have any compartments or genres but freely use and borrow across styles and cultures. I love music in all its manifestations and I want to play and experience them all, from rock and jazz to classical and funk and across continents. So yes, it is a deliberate choice and production music allows that to happen. Do you still actively play in any band, group or ensemble – live concerts, anything like that? Live music has always been a part of my life but unfortunately, lately, that has not happened. I hope to change that in the near future and get involved with like-minded souls who like to explore new sounds. 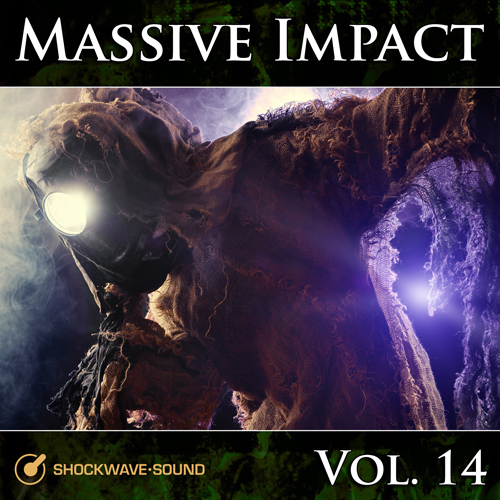 Here is the Abbas Premjee catalogue of royalty-free music / production music tracks composed for Shockwave-Sound. If you’re a regular user of Shockwave-Sound.com you’ve probably seen the name Dan Morrissey (full name Daniel Peter Morrissey) mentioned as the artist and songwriter for many of our tracks. 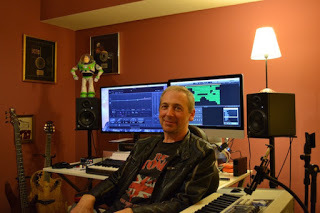 In fact, with 742 tracks in our database at the time of writing, Dan is the most prolific contributor to our stock music catalog and his music spans hard rock, ambient, acoustic, electronic, experimental, light rock / pop-rock and more. Dan was born in Fulham, London England, but grew up in Wallington, Surrey (again, England), where Jeff Beck also lived. An only child, Dan spent his teens and early 20’s working in music copyrighting and motor insurance, and by the time he was 23 he was in various original bands, touring around England and, somewhat remarkably – Turkey. 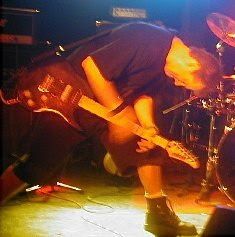 Dan has played and written with many rock bands through the years, including Fever 103, Raider, Atomgod, Tantric UK and God’s Little Joke. 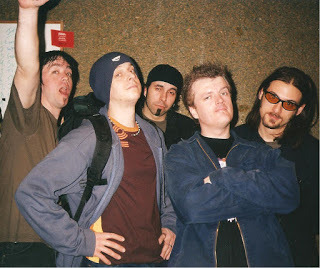 These are not groups that most of us will have heard of, but Dan looks back with joy on these years and on playing gigs along with more famous outfits like King’s X, Filter and Sevendust. As Dan himself puts it, he is now “just past that age where schlepping around the country in vans and lugging gear” is just beyond him. He does, however still write a lot of amazing music and produces tracks in his own studio. I caught up with Dan for a talk recently and got the chance to ask him about his life and his music. – I’ve seen some prolific composers in my time, but you’re quite possibly the musician with the most output I’ve ever known. 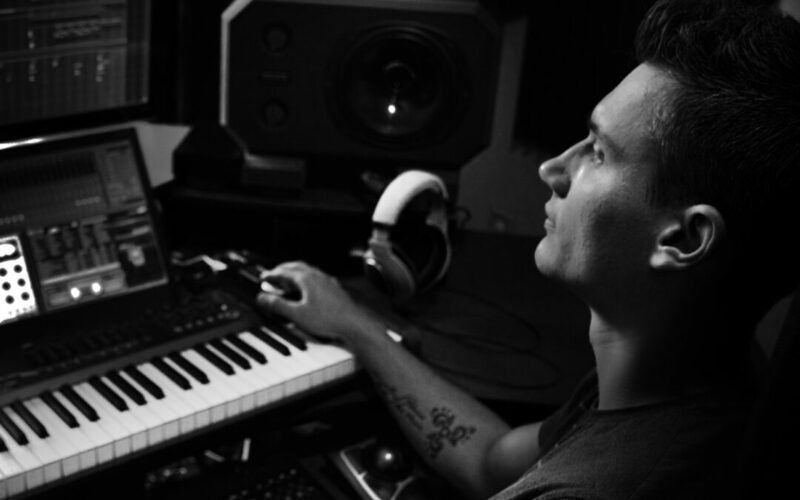 Is there ever a time when you’re not producing new music? You must be working on something new pretty much all the time, I guess? Dan: “Music is both a love of mine, a deep passion that I rarely stop thinking about, and – and obsession. My brain whirs deep into the night sometimes, considering this phrase, that beat, this sound, that mixing technique. I sometimes wish I could just switch it off. I rarely stop recording music for longer than 2 days. Then I get an itching to get back to it. If I stop writing for very long, I feel as if water behind a dam is rising and ready to burst out. – Besides the obvious source of income that the music represents for you, what else does composing music give you, on a more personal level? “Aside from making a living doing what I love, music is a comfort. Like an old friend. It helps me relax sometimes. Other times it gets me motivated. I feel there are just so many tracks I could write and so little time. When I sit down at my computer, I could write a track in any one of 10 different styles. I have such a large palate of sounds available to me now, it’s great to have such a wide spectrum of options. – Do you have any favorite pieces that you’ve written and recorded? Hmm, though question. It’s very difficult to say which are my favorites. Sometimes I actually forget what I’ve written and only when I listen a year or so later, it all comes flooding back. Often, I can’t quite imagine what inspired it’s creation. It’s almost like it was written by my identical twin in a parallel universe. For guitar tracks, I’m quite proud of tracks like Sunblade, Incendiary, Nebula, Solar Winds and Forgive. They came out very nicely, I think. You’re never sure of how the tracks will sound when completed; whether they will summon the spirit or convey the emotion you had wanted them to. This random method of composition can often help you avoid the kind of chordal and melodic cliches that we fall into on our main instrument. Just from all the years of playing what we enjoy and know we are capable of playing. – You’ve obviously written a lot of music that ended up being used in probably thousands of different media projects including films, games, presentations and more. Have you noticed or found some sort of pattern or “typical” criteria, that people are looking for when they look for music for their projects? What do you think people go for, and what makes them choose one music track over the thousands of other tracks available to them? “I’d say that all my music contains one or more of the following elements – Intensity, beauty, power, space and/or epic grandeur. At least I hope they contain some of those. 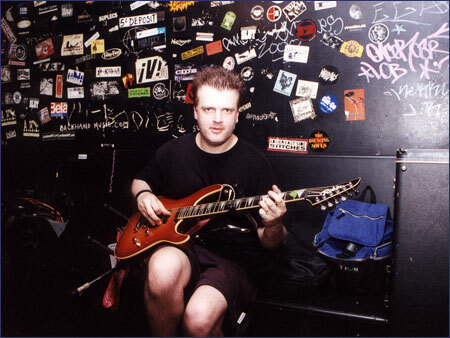 – The electric guitar is usually quite a dominant element in your music, and you’re obviously a highly skilled guitarist. But I notice that you also write and produce some music that doesn’t involve guitar at all. What’s the thinking behind that? “Although I’ve been a guitarist for 30 years now, I learned piano and flute until I was about 13. I was also brought up on classical music, so I do love piano, plucked instruments like the harp and cimbalom, and orchestral strings. I enjoy the textures and the ease with which it’s possible to create simple but emotive phrases. – Let’s say you’re just sitting down to do some work – typically, where do you start? Do you just switch everything on, place the guitar in your lap and start experimenting until some ideas for a melody comes up? “Yes. I just plug in, go through some guitar sounds on my Kemper amp and see what happens. Or alternatively, get a cool drum groove happening. Usually something will happen within 10 minutes, otherwise I’ll change instruments. If nothing starts evolving fairly quickly, I might stop for a while, for fear of forcing creativity. I am not, fortunately, dogged with writers block very often. I can get something interesting going quite often, and fairly swiftly. That’s not to say that everything I record is great. Very far from it. But I feel you have to clear the way of dross for the more inspired music to spring forth in its full glory. Does that make sense? I hope so. Can you remember the first time you were in touch with Shockwave-Sound.com and if so, do you have any particular memories of that? I’ve been working with Shockwave-Sound.com for a good while now. You seem to care about and connect with your composers much better than most companies. Most library music companies will treat you like just another number, one of the many thousands, usually. But Shockwave-Sound.com is a nice company to work with. Very personable, enthusiastic, dedicated and efficient. I always appreciate the massive amounts of sheer hard work you put into every project. I’m very honored and happy that you take a deep involvement in my music and give me in-depth feedback. It can be a faceless business we’re in and often, getting our music out there is a thankless task. Shockwave-Sound.com makes this job more rewarding all round, so I’m very grateful for that. – Thanks for that, Dan! Now, do you also write bespoke music for projects “to order”, or do you now only write for stock music / production music catalogues? I write for many different projects. Of course, it’s mostly for production music purposes and gets used around the world for an array of different projects – from beer ads and martial arts troupes, to talk sport radio, motorsports, extreme sports, magicians’ sites and “Babestation“, of all things! Some times I get asked to write little pieces, given a specific brief and also record and co-write songs and mix vocals for a fairly successful Texas management company, for the various up and coming artists he has under his wing. These are mainly pop-rock acts from the USA and Australia. I love instrumental music and most of what I do is exactly that, but songs are really where my heart lies. Working with vocals adds another dimension of power and meaning to music. I’m very lucky to still be able to do this, with my recording project God’s Little Joke, despite the fact that we don’t tour any more. God’s Little Joke. Dan Morrissey fourth from left. – I’m guessing you have a few different guitars, do you want to say a bit about them, and which one(s) is/are your favourite axe(s)? I have a Vintage AV2 Icon Telecaster i e-tuning. It has a very low pickup output and thus great tone. Very responsive to fingers and picking velocities. It’s great for country and blues stuff. My workhorse guitars are a Dean Doltero Braziliaburst and a Squier chambered Thinline-style Tele for drop D chunky rock tracks. A Walden acoustic which has a great resonant, room-filling sound. An Ibanez JS1000 for when I’m in the mood for some improvised lead playing – it just makes me play better, somehow. 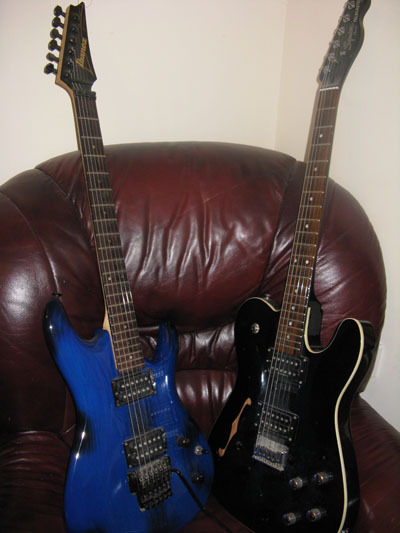 It’s also the only guitar I have with a tremolo arm. And last, but not least, a PRS SE Clint Lowery for super detuned, chuggy metal tracks. 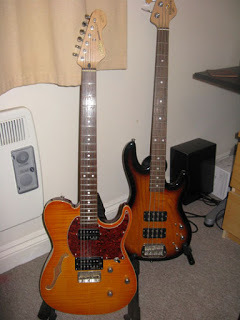 Personally I don’t like 7-strings guitars, so the SE plays fantastically in that lower register. A brilliant guitar for the money spent. – Can you tell us a little bit about your recording setup, e.g. which sequencer / digital audio workstation you’re using to record and edit your stuff, and which instruments / plugins / virtual instruments / keyboards you use most in your work? I use Logic 9, an RME Fireface 400 audio interface, and Yamaha HS80 monitors, which are absolutely fantastic. By far the best I’ve heard in their price range. I also use a Focusrite ISA One preamp and a myriad of software plug-ins. Lots of Waves plugs, mainly for compressors and mixing vocals, when I need to, Spitfire Audio harp and orchestra samples, really fantastic and unique. Sample Logic, Soundiron and 8dio stuff, which all work in Native Instruments Kontakt Player. I also use some Rob Papen and UH-E synths and Spectrasonics RMX and Trillian plugins. Izotop provide my mastering software. Ozone 7 is a great tool for us non-mastering engineers, with which to polish up and add punch and a pro sheen to the tracks. One of my best buys from recent years is the Kemper profiling amp. An astounding and amazing piece of kit. Truly a wonder of modern technology! Through this wonderful object I can obtain the sound of over a thousand different amplifiers. And it takes up a great deal less space! When I sold my treasured ’82 Marshall JCM 800 split channel head, I went to a JMP guitar preamp… but then came the Kemper and I’ve not looked back since. 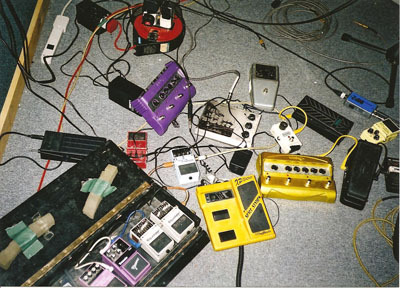 You gotta have some pedals! – What about your Piano sounds; where do you typically get the samples/sounds for that? For piano sounds, recently I use Native Instruments-The Giant, 8dio’s 1990 Prepared Piano, Native Instruments – Una Corda, and Soundiron’s Emotional Piano. – With all that time spent writing and recording music, do you ever get a chance to simply listen to music? I’ve noticed that the time I have to actually listen has badly diminished over the last 5 years or so. It’s a bit tragic really, but I feel I have so much music to write. Some times I just have to make myself stop, relax and absorb someone else’s creative spark. My CD and record collection has gone from about a thousand vinyl and a thousand CD’s, right down to about 300 CD’s now. I realized I was hardly touching most of them and thus wouldn’t miss them that much. Mostly, I listen to music in the car. It’s a great way to be able to go on a musical journey whilst also on a geographical one! They enhance and compliment each other very nicely, I’ve found. – What are some of your favorite artists? Hmm, so many influences. I suppose, in some kind of rough chronological order, I’d say Beethoven and Rossini from my childhood and the influence of my parents. Then came Abba, Queen, XTC, Blondie, The Stones, Led Zeppelin, UFO, early Whitesnake, Rush, Aerosmith, Toto, Thin Lizzy, Jourrney, Van Halen, Black Sabbath, and many, many hair metal bands who are often unlistenable in this day and age! Then on to Pearl Jam, King’s X, Alice in Chains, Killing Joke, Quicksand, Nine Inch Nails, Our Lady Peace, Flyleaf and Imogen Heap. 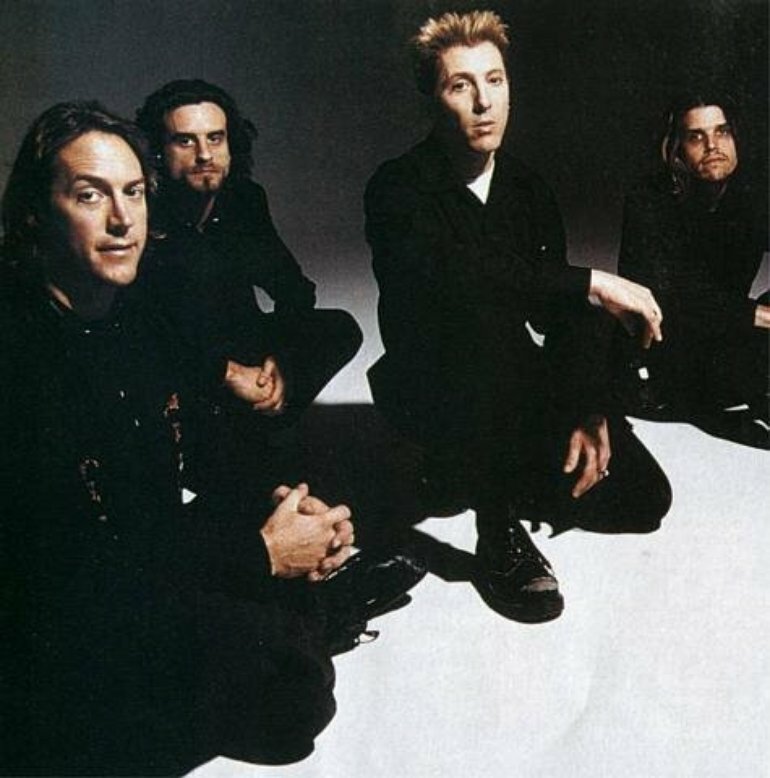 And perhaps the top of the pile – Tool, a truly terrifying band. I just hope they start recording again soon. They’ve been away far too long. Some of my favorite guitar players would include George Lynch, Alex Lifeson, Jimmy Page, Joe Satriani, Gary Moore, Neal Schon and Steve Lukather. But I admire thousands of players, I really could go on and on. – Finally before I leave you alone and let you get back to your recording, Dan — Would you have any advice or guidance for a young music writer just starting out on a long journey, trying to make a living on writing music? Any do’s and dont’s? I’d say – Listen to all sorts of bands and music, even if it’s just once. Take on board what other musicians tell you, and if you can find a mentor, listen hard to what that person says. Always go with your heart. Learn to play what you want to hear. Practice until your hands and your head hurt. Play along with anything that comes on to your TV: Commercials, jingles, soundtracks. It’s all good training for the ears. Never make music just to please others – you’ll lose your soul. Gain as much experience as humanly possible. Try to find a balance in your playing, between technique and gut instinct, and you might find yourself half way to brilliance. Commercial success is not what makes a musician great… or happy. Thank you for those words of wisdom, Dan! And thanks for taking the time to speak with us. It’s been a pleasure. We don’t write a blog feature about every new track or album we release here at Shockwave-Sound, because our poor readers would not be able to keep up with the constant stream of new music tracks and collections being published. For example, over the past 7 days we have released five new albums, with about 10-12 tracks on each – these are now all available as individual tracks in our track catalogue, and as CD-collections / albums in our “Collections” area. However, once in a while we release something that we feel is a bit special and deserves a closer look, and a little bit of a “splash”. Our very latest, the album Secret by Peter Cavallo, is such a case. 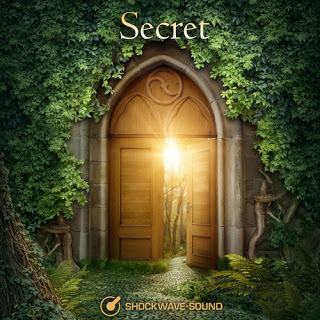 “Secret” is an album of 12 astonishingly beautiful, haunting, delicate and considered pieces in neo-classical or classic film soundtrack style. Made completely without any electric or electronic sounds, this is an album of timeless music that will go just as well in a film 50 years from today, as it does today – and indeed would have done 50 years ago. I strongly recommend you listen to these amazing Individual Tracks by Peter Cavallo as well as this album release titled “Secret“. Your music is very accomplished, very detailed, you are clearly not a beginner. Have you released any album or soundtracks previously? The selection of tracks on Secret were written over a period of one year, in between all the other music I wrote. All of these tracks were selected as they seem to have a theme that tied them together. It was if the album was writing itself over time. 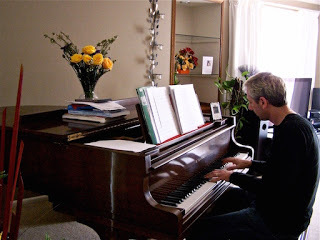 Every time I would sit at the piano, which is my main writing tool, these melodies would flood through and within an hour I would have a finished sketch. While it was still fresh I would put down a piano only track of the entire piece, then sit back and listen to the orchestra in my head. The rest is total organised chaos, a flurry of activity and frustration trying to get sample libraries to emulate what’s going on in the symphony in my head. This is where the time factor comes into it. I spend a lot of hours on a track just getting the sounds to be as authentic as possible. 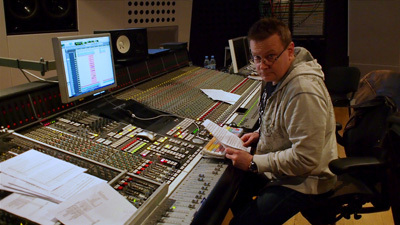 The tracks themselves were composed very quickly but the orchestration takes way longer for two reasons. 1. Samples libraries are like balancing an elephant on a bar stool. 2. I don’t know what I’m doing. Am I happy with the final result? Of course not! But you cannot dedicate your life to one piece of music when there is so much more waiting for you to connect with. Are you inspired or influenced by classical music composers, if so which ones, or more by contemporary film soundtrack composers? I would have to say the composer that has influenced my thirst to write music would be Rachmaninoff. 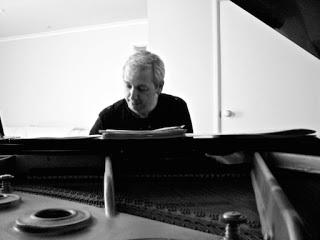 He was one of the most innovative and passionate composers I’ve heard. In the movie soundtrack world it would be Ennio Morricone, Thomas Newman, Max Steiner. Some smaller but very influential composers have been Bill Brown and Steven Gutheinz. I don’t actually listen to much music unless I want to study it and learn from it. Do you use any live instrument recordings for your productions, or are you just very clever with samples and simulated instruments? I would love to use live instruments all the time. As good as sample libraries are they are still no match for a real player, full stop. I used a violin player in one of my tracks simply because it wouldn’t work at all with a sample violin library. That track is called ‘In the Tears’. This touches on a very frustrating aspect to my composing. What I hear in my head and what ends up as the finished result is actually a very poor comparison of what it could be. Because what I hear has no boundaries and I am frustrated by my lack of ability and knowledge of music to fully be able to articulate precisely in a score of how it should be performed.This is why over the last 8 months I have been studying music with a Canadian Composer called Alain Mayrand who is slowly teaching me that music has colour, emotion and rules. Music paints pictures in the mind of every listener – the challenge is to get every listener to see the same thing when they hear your music. Music has emotions – chords, harmony, pitch and rhythm. When used with purpose can make you cry and laugh in the same measure. Rules can be broken but with correct knowledge. I can say with certainty that one day I will compose with true clarity and purpose and hopefully with real players. If you could go back in time and compose the musical score for a any major movie from history, which movie would you have liked to compose for? I love movies and a great score is hard to find these days. Recently I read an article about Max Steiner and how he was given a project to do with a very limited budget and no one was sure it was even going to work as a film. The film was ‘King Kong’. Max Steiner composed a wonderful score but his budget was so small he could only afford a hand full of musicians. 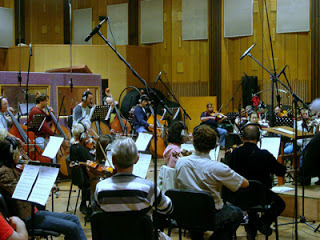 When they recorded the tracks he had musicians and himself changing instruments in mid score. He was one of the first innovators in film music and that really inspires me. Not that I could do anything like Max Steiner’s work but I would have loved to give King Kong a go. No sample libraries just the raw material that makes music real and live! Can you tell us a few words about yourself and your part of the world, that has nothing to do with music or your compositions? I live in Canberra, Australia. Canberra is the Capital of Australia, not Sydney as many think it is. Canberra is the smallest of the capital cities in Australia and is where all political decisions are made. It is a like a country town, nice to live and bring up a family and 2 hours drive to the snow (winter) or beach (summer). 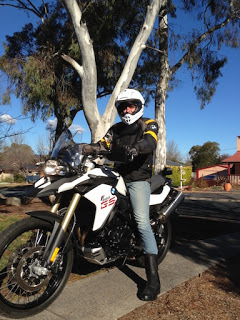 I have an adventure motorcycle that allows me to escape and go travelling and one day I hope to, with my partner do a world tour on motorcycles. I have hit a kangaroo while riding my motorcycle, which was something I do not wish to try again. We both survived, thankfully, with a story to tell. I have the most wonderful partner who supports me fully in what I am trying to do in music and she is the best part of my life. At Shockwave-Sound.com we recently had the pleasure and honor of releasing the latest volume in our “Massive Impact” series of big, epic music. This album, and some of our others, feature recordings of actual live philharmonic orchestras, playing along with samples and electronics, for a grand, soaring, rich sound. 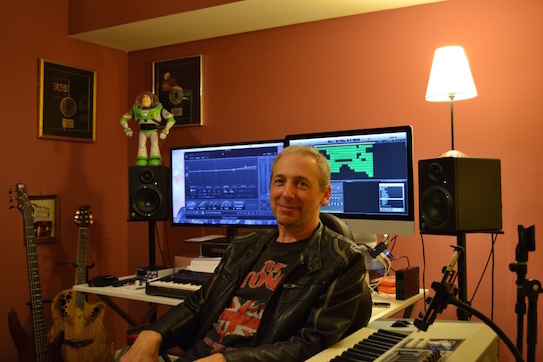 We thought it would be interesting to set up a talk with composer and arranger Iouri Sazonov (aka Yuri Sazonoff) to find out a little bit about what it takes to carry out a project like that. We spoke with Iouri about working with live orchestras and about the Massive Impact Vol. 14 project in particular. So for a project like this, where do you start? “The process begins with composing the music, and that is something that goes on over weeks or months. I play with ideas using only MIDI / simulated orchestra sounds at this point, and I will usually come back to an idea or a piece a couple of days later, to see if it’s still good, if it’s worth continuing the work on this piece. When I have a rough concept for a track in place, I will send it to Bjorn (Editor’s note: that’s Bjorn Lynne, manager at Shockwave-Sound.com and executive producer for the project) for approval. Ok, so a few months later you have a collection of tracks, all done just with MIDI and samples, you then start to think about recording with an orchestra. Can you describe the process from there? “When I’ve got 10 ready to go MIDI tracks, I will start to talk to a couple of studios I regularly work with, to try to find an available time slot to accommodate my needs. Careful planning is the key. 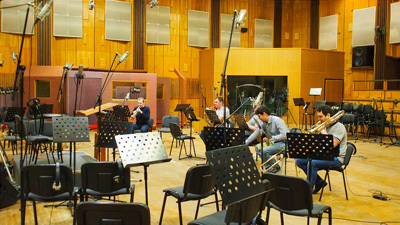 You can never be too well prepared for an orchestra recording session. Without the utmost care and attention to every little detail in the planning stage, you are risking wasting precious time and money during the recording sessions. How do you make the printed sheets of written music that the players read from? 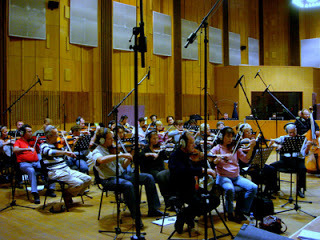 “As part of the preparation stage, I do score and parts preparations in Sibelius, do few basic stereo stems, click tracks and MIDI files to be imported in ProTools into ready-to-go orchestral setup prepared for the sessions by my engineer. It all takes a considerable amount of time, but needs to be done, and needs to be done well. I always quantize each part to be recorded live. (Editor’s note: “Quantizing” is the process of “correcting” each musical note to the exact musical time where it should be, rather than just before or just after, as a human would play it). Otherwise, the scoring program of your choice, usually Finale or Sibelius, is not going to recognize all that nonsense from the MIDI file you just imported, and it’s going to look like “mission impossible” for the musicians. It’s easier to quantize notes in your DAW (Editor’s note: DAW = Digital Audio Workstation) than trying to figure out all the crazy notes produced by un-quantized MIDI files. People who are more inexperienced with notations will sometimes drop unreadable and unplayable scores in front of players, and this will definitely give you a big problem. Playability, by the way, is another thing to consider. 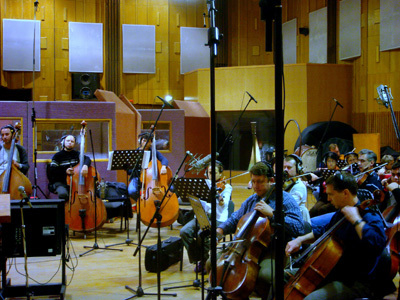 You want your score to be recorded quickly, and to sound good. For that you have to present parts that are playable by musicians. Mistakes in the score will always happen – bit it’s better when they don’t! So I double check, triple check and proof the read full score for any accidental mistakes that can happen just from the slightest wrong move you make with your computer mouse. Mistakes cost time, lots of time, and you can easily get behind schedule. What would a typical “mistake” be in this setting? I’ve seen the players wear headphones that they have over one ear – what do they hear in there? We’ve been talking quite generally, but can you tell us a bit about the actual recording sessions for our “Massive Impact Vol. 14” album? “For this projected I decided to do the recording by instrumental groups – first strings and then on separate session I do the brasses. It’s quicker this way and makes everything more efficient. My engineer and his assistants usually give me a little break and build the setup the night before, if possible of course. 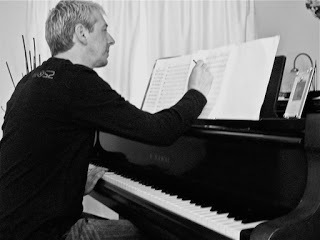 “The string sessions went very smoothly this time, and I had enough time to do all the tracks and then go back to fix/improve couple of things I’d made notes of, something I try to do if time permits. I make notes on my paper copy of full score, the good old way with a pencil. You circle the problem instrument at the problem bar, write T2- or T3+ for take number, and so on. This way you are able to do it as you go along with the performance. I’ve seen lately many guys trying to make notes on the fly with their iPad, but the thing is that even if you are really fast at typing, the music goes faster and you’re missing lots of things to make note of. At this point you’ve let the players go home? What about the singing? In these tracks we can hear both huge choirs and a soaring soprano voice? Thanks for talking to us Yuri, I think everybody will agree that the result is really great and you can hear more of Yuri’s work for Shockwave-Sound.com by following this link to all of Yuri’s tracks here on our site.